Last week’s PPO breakouts piece would have helped you unearth Alex Collins, Kenyan Drake, Delanie Walker, and others prior to their huge games. We’ll be looking to uncover some more hidden gems using opportunity-based efficiency stats for Week 14. This is a potential blowup spot for LeSean McCoy at home against the Colts, who have given up the sixth-most fantasy PPO to opposing running backs this season. Lamar Miller is a good candidate this week against the 49ers, who have given up the second-most fantasy PPO to enemy backs through the air. Miller’s 309 receiving yards quietly rank 10th among running backs this year. Samaje Perine should be able to keep the ball rolling in Week 14 against the Chargers, who have given up the fourth-most PPO to opposing rushing attacks this year. Over the past three weeks, Perine’s 59 rushing attempts rank fourth among all running backs — just one tote away from the league lead. Corey Clement played 37.3 percent of Philadelphia’s snaps last week, his second-highest rate of the season, and this week the Eagles play the Rams, who have given up the second-most fantasy PPO to opposing running backs this year. For his part, Clement ranks seventh among individual running backs in PPO. Clement is far from a sure bet, but this sets up as a good week for him on a per-opportunity basis. Play your wideouts against the Buccaneers. This week, the top option should be Marvin Jones, whose eight touchdowns are second-most at the position and whose 17.1 yards per reception ranks seventh. The Buccaneers have given up by far the most fantasy PPO to opposing wideouts, so a big-play receiving like Jones should feast. I love Marquise Goodwin here against the Texans, who have given up the third-most fantasy PPO to opposing receivers this year. Goodwin’s 4.27 speed will be no match for Kevin Johnson’s 4.52 speed, and Goodwin’s 19.3 YPR is tied for third among receivers. He’ll just need a couple of good opportunities to do damage. Adam Thielen and Stefon Diggs should find success against the Panthers secondary, which is giving up the sixth-most fantasy PPO to enemy receivers this year. Thielen and Diggs both have top-seven individual WR-CB matchups this week. Thielen (eighth, 0.47 PPO) and Diggs (16th, 0.42 PPO) also both rank in the top 20 in terms of individual wideout PPO this year. This should be a big week for the duo. This will be a big week for Michael Crabtree, who ranks tied for eighth among individual wideouts in PPO scored. The Chiefs, his Week 14 opponent, have given up the second-most PPO to opposing receivers this year, and Amari Cooper might miss the game, giving Crabtree even more looks. Even if Cooper plays, Crabtree is in a great position this week. Austin Seferian-Jenkins has a nice matchup against the Denver Broncos, who have actually given up the most fantasy PPO to opposing tight ends this year. That’s surprising, given all of the attention that’s given to the Browns and Giants and their (legitimate) struggles against tight ends. 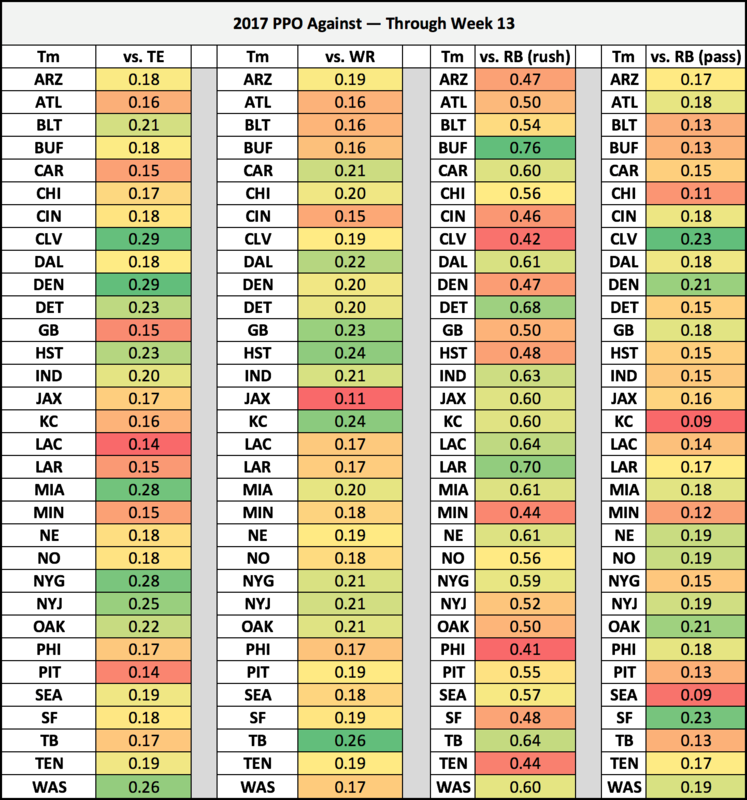 Denver has been just as bad on a per-opportunity basis. Hunter Henry had good stats last week in a good matchup (7-81-0), and he should have similarly good production in Week 14 against the Redskins, who have given up the fifth-most fantasy PPO to tight ends this year. Henry ranks tied for sixth among all tight ends — along with Zach Ertz and Travis Kelce — for individual PPO scored. Cameron Brate caught just two passes last week, but they both went for scores. His fantasy PPO on the year now sits at 0.41, tied for 14th-highest among tight ends (tied with his teammate, O.J. Howard). Brate has a great matchup against the Lions in Week 14, who have given up the eighth-most fantasy PPO to opposing tight ends on the year. Dwayne Allen has run a pass route on less than one-third of his snaps this year, but he has been more involved in the pass game in recent weeks, catching five passes over the past four games after catching none through nine weeks. With Rob Gronkowski suspended in Week 14, Allen will step in against the Dolphins, who have given up the third-most fantasy PPO to opposing tight ends this year. Allen’s to-date usage makes him hard to fully trust, but the matchup and circumstance won’t get any better for him — maybe ever.